This study explores the pitch and rhythmic content of the melodies of Frank Zappa. It also describes the relationship between Zappa’s melodies and their harmonic climates. Three pieces are analyzed in detail. The analysis of the guitar solo “Pink Napkins” serves to introduce Zappa’s theory of harmonic climates. A system is devised to explore consonance and dissonance relationships in the solo. The analysis of “The Black Page” explicates Zappa’s use of “rhythmic dissonance” by means of the relationship between a melody and its “factory-cycle” pulse. 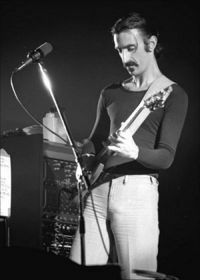 Comparisons are made between “Pink Napkins” and “The Black Page” in order to describe the free exchange between Zappa’s improvisations and his composed melodies. Finally, the analysis of “Be-Bop Tango” engages Zappa’s atonal process and describes the structural importance of long-held notes in the piece. Other aesthetic concerns in the music of Frank Zappa are addressed.